The Obligate Scientist: Religious Fundamentalists vs. 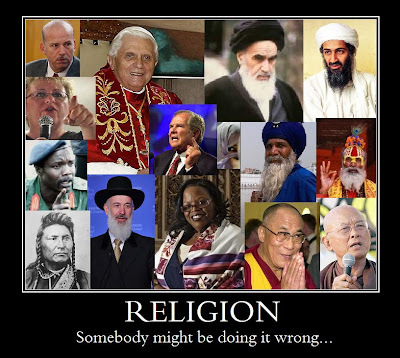 Religious Moderates: Tell Me Again Who's Got Their Religion Wrong? Religious Fundamentalists vs. Religious Moderates: Tell Me Again Who's Got Their Religion Wrong? I'm not a religious or superstitious person, but for as long as I've thought about these things I've been in awe of how people acquire and adhere to these kinds of beliefs. It gets particularly interesting when someone is confronted with evidence contrary to a belief - or contrary to the justification for adopting that belief - or when one tries to apply some of those justifications across different religions with surprisingly mixed results. for most people's beliefs to be correct. But how can we tell who (if anyone) has the right religious/supernatural beliefs? If we look beyond the core conflict presented in the BioLogos post -- the one between Genesis and science based claims about the origins of life -- there's a sizable religious conflict here: Biblical literalists vs. moderates who accommodate an empirically informed view of the world by adopting a trimmed down version of Christianity. I think it's fair to say most Christians (at least in North America) fall into this later category. A quick read through blogs like WEIT or Pharyngula reveal that scientists who are die-hard philosophical naturalists don't like half-assed science. They value most a perspective on the external world that is checked against that same external world, and are wary of claims that may be rooted only in the human imagination. Before you fault these atheists for being stubborn or in denial, take note that religious people do this too... most fundamentalists I've encountered don't like half-assed Christians. Unlike scientists who firmly adhere to methodological naturalism as the gold standard for adopting beliefs, religious fundamentalists who adhere to religious dogma get way more negative attention from their moderate counterparts. Science done according to the highest scientific standards almost always affords the scientists respect and support in their endeavour. How to religious moderates treat religious fundamentalists? When religious extremists (of any faith) use religion to justify their actions to the rest of the world, moderate members of that religion frequently distance themselves by claiming those extremists aren't really being true followers of the faith, maybe that they're taking sacred texts out of context, or that they're somehow or another just not doing it right... even though they acted in accordance with some religious text or similar divine dictum. In return, fundamentalists often waggle their fingers at (...or murder) those who aren't sticking to the rules, slacking off on their religious duties, those who reinvent "their religion" to suit seemingly arbitrary personal preferences. They somehow or another take them to task for not really being true followers of the faith. I can see the justification here actually - so to condemn such actions one really does need to either reject their religion and/or have good reason to say that they are the ones who have their religion wrong. If you'd like another example: Ophelia Benson had a few posts recently going back and forth with Sholto Byrnes about Sharia law and Islam. See Sholto's series Rethinking Islamism, and Ophelia's posts here and here. Parents of European, or Ashkenazi, origin do not want their daughters to be educated in the same classroom as schoolgirls of Middle Eastern and North African descent, or Sephardim, claiming that they are not as religious. See - they're just not white religious enough to be true Jewish schoolgirls! Uh, umm... Riiiiight. So what's the outside observer to do? It's all a bit confusing really... Should the rest of the world really avoid criticizing religious dogma when someone follows it and commits some heinous act as spelled out by that dogma? If not, why? Some sort of a "blame the readers for acting on what they read, and not the sacred texts that told them what to do" sort of thing? Maybe we should join moderates and accuse fundamentalists of following their religion incorrectly? But on what grounds? No, but wait, aren't the fundamentalists the ones trying to follow the religion properly? So maybe we should support the fundamentalists in saying the moderates have it all wrong, while also criticizing both that religion and those fundamentalists for their respective teachings and actions? But what if it's a good thing that moderates have their religion wrong? What if it really is wrong? We wouldn't want to make everyone into confused extremists all barking up the wrong tree, would we? And tell me again how we can determine which (if any) of the people on the planet have the right religious beliefs in the first place?